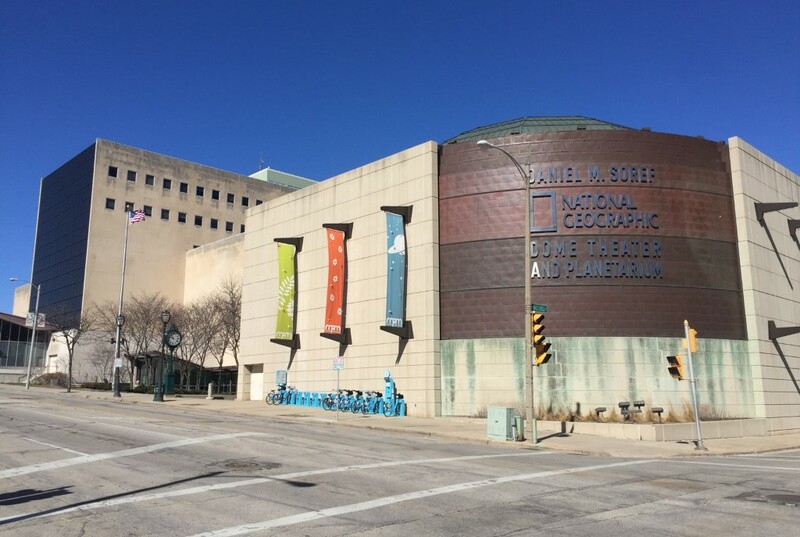 The Milwaukee Public Museum seeks $150 million for a new home, $50 million more than was previously reported, and that could include $50 million from Milwaukee County, in return for which the county would end its annual subsidy of the museum. The museum also hopes for equal support from private donors and the State of Wisconsin. That information was disclosed by Dennis Kois, the President and CEO of the museum in a recent presentation to a small group of potential supporters. Dennis Kois. Photo by Michael Horne. These numbers are provisional and could still change, noted Hillary Olson, in a follow-up interview with Urban Milwaukee. But the strategy of seeking support from the county, state and private donors is clearly key to the museum’s effort. 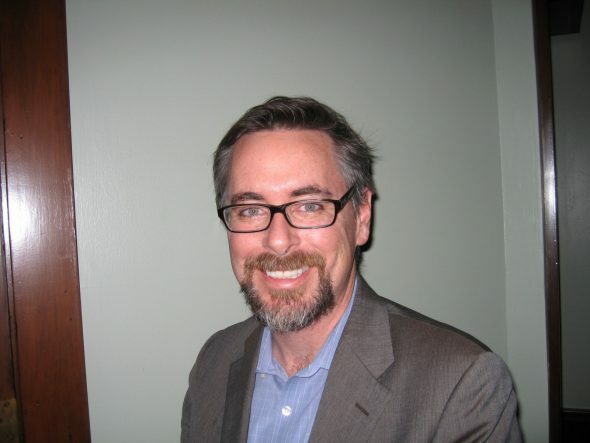 Kois, a Milwaukee native, was named to his current position in February 2014, assuming leadership of the city’s oldest museum, a four-million object collection chartered in 1882 that drew at that time 500,000 visitors annually. He was tasked with straightening out the museum’s shaky finances and plotting a strategy for the future. MPM has acknowledged publicly that leadership has been investigating whether to construct a new museum building downtown to replace the failing, 60 year old County-owned building MPM currently occupies. Kois has been giving talks in the community about the need for a new facility some 200 times, he has said, and Plenty of Horne received an invitation to attend one such forum in a downtown apartment overlooking Lake Michigan. Kois traced the changing roles of U.S. museums, beginning with the first, now the Museum of the City of Baltimore, founded in 1822 by Charles Willson Peale. This was a collection of objects arranged according to the learned precepts of the Linnean Society of London, the world’s oldest natural history organization. Museums rapidly evolved into places of entertainment, Kois told the 20 neighbors gathered for the presentation. “Barnum, before he had a circus, had a museum,” Kois said. The Barnum’s American Museum was New York City’s premier tourist attraction from 1841 until it burned to the ground in 1865. Today, museums “like to think of themselves as serious, educational institutions,” the director told the audience, suggesting that perhaps a bit of Barnum is what the museum world needs today, in an age of instantaneous communication and short attention spans. “The museum world has changed,” Kois said. Natural history museums traditionally change up their permanent exhibitions every 10 or 15 years, he said. But in Milwaukee, “we are trying to exhibit using 50-year-old stuff. Much of the knowledge has been superseded,” he said, noting the museum’s evolutionary timetable as now exhibited is grossly behind the most recent science. The complex rainforest exhibit dates from the 1980s, he noted. It was designed as a companion to an actual rainforest that the museum once owned, and had to sell. “So if all of these things are available on-line, why are people here? Because objects have power, and because museums exist for creating wonder,” Kois said, while a quote by Socrates, “wonder is the beginning of wisdom,” was projected on the wall. Community forums have dwindled, Kois said, referring to the numerous social societies and clubs that dotted the community back in the days when the public museum was a city-owned and later county-owned facility funded by tax dollars. The museum remains as a forum, he said, and in his estimation is a state-wide institution without parallel. The museum now draws 550,000 visitors a year, Kois said, and the visitors come from every county and many of the school districts of the state. But the facility is old, with serious leakage problems that have cost over $250,000 in damage to contents last year. “This is absolutely unheard-of in museum circles. When it rains outside, it leaks inside,” he said. “The museum was built the same year as the Domes and has been taken care of as well,” he added, referring to another challenged structure in need of repairs or replacement and also under county ownership. Adding urgency to his call for a new museum is the pending 2020 review by the American Association of Museums to continue the accreditation of the museum. “There will be no way for us to keep accreditation without a plan in place” for a new facility, Kois said. Working with Gallagher and Associates, a Washington D.C.-based museum planning firm and local architecture firm Rinka Chung Architecture, Kois showed the attendees a plan for a new museum that would be about half the size of the existing structure. Improvements in technology will allow for a more efficient structure, and the museum is rethinking its approach to vast dioramas in favor of more interactive exhibits. “The building is too big,” at 500,000 square feet, he said. “Giant halls with dioramas is not the way to go.” The new museum would include restaurant and gathering spaces, as well, and would be located elsewhere downtown, likely on the streetcar line. Kois would also divorce the museum from county ownership, following somewhat along the lines of the Milwaukee Art Museum. The county owns the building and the collection, and contracts the Milwaukee Public Museum to operate the facility. Kois would like the museum to become wholly independent, yet the county now contributes $3.5 million a year to its operation — about one-quarter of the museum’s budget. But, due to the county’s own financial difficulties, Kois says that support “will be zeroed out” in the near future. The museum would also want its own parking structure, which it lacks now. At this time museum-goers represent about $1 million in parking revenue for the City of Milwaukee, which does not share that revenue with the museum. The museum would also likely sell its naming rights — not to a corporation, Kois said — but perhaps to an individual. Kois believes he has a sound plan to assure the future of the museum. “All we’re missing is $150 million,” he said. Kois noted that, as a statewide attraction, the Milwaukee Public Museum merits state funding as well as local support. The only major museum nationwide built in this century without state-level support is the Milwaukee Art Museum, he added. His hope is clearly to get an amount from the state equal to the county contribution. The other third of the funding would come from community support from private donors. Compared to the $120 million in private funding raised for the Milwaukee Art Museum’s Calatrava addition, $50 million is a small number, but compared to probably any other private fund drive in the city’s history, it’s a daunting figure. Without sufficient endowment to help pay for annual operating costs (and replace the annual county subsidy), the new museum could quickly fall into a danger zone. As Kois made clear, this plan is meant to assure the future of the state’s most venerable museum for many decades to come. Maybe the State of Wisconsin can negotiate so that their $50 million dollar investment is tied to eliminating an admission charges for children 18 and younger. 150 mil…can anyone think of a better way to use this money? do we really need a new “museum” when we have Discovery World…it’s a tourist attraction and not much more. Nostalgic, and from that standpoint, maybe rich grandparents and great grandparents will step up and donate monies. Our family loves the Public Museum and Discovery World. We are members of the former and visit a few times a month. Our kids love it and never tire of it. They also love Discovery World and we visit once or twice a year. It’s a great museum but a little pricey. Both are wonderful institutions are hardly just tourist attractions. Spoken like someone who visits neither. Why not fix the roof and simply add on to the existing structure? That keeps all of the charm of the original and allows for new exhibits at fraction of the cost of a full new structure. I’m really worried by how dismissive he is of his own museum’s dioramas. They are remarkable works of science and art, some of which are WPA projects. Tossing them out is tragic, bordering on reckless. The Museum of Natural History is investing in restoring its dioramas, and the Field certainly isn’t dumping its dioramas, so why on Earth would we get rid of ours? The whole direction is so perplexing. It’s like he sees the things that make MPM unique and has contempt for them. No Republican outside of south east Wisconsin will vote for this and if they due the Democratic party will spin political commercials ripping on them for giving “free” money to Milwaukee. This is dead on arrival in Madison. Judieth moriarty please shut your piehole! There are objects in our museum that are priceless! 3thosand year old egyptian mummies. Rocks from outerspace! Wow!stop texting. Discovery world has… Videos on how electrcity works. Pictures of the ecosystem flows Do you drink wine out of a box? No more comments from you .please! Incredibly disappointing they’re thinking about so drastically downsizing. The museum is already fairly small when compared to other museums in cities of Milwaukee’s size. Mr. Hillard is right about the dioramas. Who wants to got a museum just the stare at screens/flat displays all day? I can do the same for free at library or home. Milwaukee is fortunate to have Dennis Kois here—he brings remarkable acumen, experience, and vision to this position. HIs deep background in museum management has given him real-world experience and expertise in how to both manage this museum and ensure that it is around for us to enjoy for decades to come. The current structure is simply, woefully unsound. To leave this museum the way it is means both the ongoing damage to and loss of the current collections as well as the reality of having a museum that is no longer accredited. I am very grateful that Kois has chosen to come back to Milwaukee and to work with other community leaders to find ways to make this museum the kind of major museum it has the capacity to be. Lynne Shaner, I have to disagree. Not only do I find the dismissal of the museum’s diorama’s profoundly concerning (it also makes me question the actual cost of a new museum, since I highly doubt that $150 million figure includes the loss of those assets) but in the latest round of layoffs among those who was fired was Wendy Christensen, the museum’s resident taxidermist who’s award for the Sampson still adorns the Hall of Science. It is quite uncommon for museums to have a resident taxidermist, let alone one who is so incredibly talented. This feels shortsighted at best and illustrates what little regard Mr. Kois seems to have for what makes this museum special. He has spoken dismissively of the Milwaukee Style, the style of diorama that the museum is built around, a revolutionary style that was widely imitated and continues to bear the name of the city where it was developed. No one is arguing that the state of the current structure is acceptable, but it’s not unreasonable to question what we stand to lose if we go forward with his plan. I have to agree that the dismissal of the current museum structure is a little disheartening. I’m a member of the museum and take my kids 5 times a year. The diorama’s are what make walking the musuem halls interesting. If the entire museum looked like the new ancient Rome exhibit (lots of rotating pieces with tablets on the wall with information) I doubt I would make it once a year. I’m also not convinced that getting rid of the county ownership is a good idea. Good or bad, the county ownership is more risk averse and will limit bad financial decisions. What happens wihen the new musuem owners make a few bad exhibit decisions or have a down year or two, but you still need to pay the world class museum director 1mm a year ($20 ticket prices is probably the answer). The musuem is a public good and should remain a public entitiy. I couldn’t agree more with Mr. Hillard, Yes the state of the musuem is not great, but I keep seeing these articles in local papers that make it seem like a new 150mm structure in a different neighborhood (i.e. the neighborhood is nice enough west of the river) is the only option on the table (becuase there was a leak once and something got wet. That happened to me in my old house, I fixed the leak). The idea that the musuem may lose its accredidation just feels like a scare tactic. At the end of the day, this just needs a lot more public input. The dioramas are what make the museum unique! My kids love them, and they promote discussion. Kois should definitely think twice before abandoning them. Interactive touch screens are nice, but anyone with an iPad can already have that experience at home. It is an onimous sign that new leadership is so quick to ignore heritage. This is an imperial attitude. Making a story which leads to leaving the current building because it is too big makes no sense. This idea is wrong and everyone involved in this kind of nonsensical thinking should be ashamed. Who does this make sense to? Nobody from here…. Consider moving out of downtown. You will get better traffic and parking elsewhere. Hummmm What is accomplished by moving it to a new building in a dense area when with a degree of luck it will be either on or within a block of the first or second extension of the Street Car line. The building leaks but that does not make the building a structural liability does it? Yes some of the exhibits need to be replace and others need to be updated and maybe in a way that allows for continued updates. There now lakes and rivers and waterfalls on Antarctica that were not there when I was a child. We are members but only go once or twice a year but the “old exhibit” at the top of the stairs will have to be moved as will streets of Old Milwaukee as will???? I am sensing that there will be a lot of stuff that will need to be sold off or housed and no one is even talking about that. Building a new building is not the answer and I like free admittance for kids. They will bring their families in 25 years and we are in this for the long haul are we not? Fix the roof if it leaks! The location and building are fine. And the dioramas are world-class!! They inspire all ages; especially today when people don’t often see such incredible 3-D science-based art pieces. Kois’ attitude is totally backward and out of touch. The museum needs to be better linked to local educational institutions. Build on what we have rather than tossing it away.This Kois will be gone in a few years. The museum is what we are lucky to have, not him. Are all Milwaukee County buildings falling apart??? How about taking care of deferred maintenance? I agree that directors always move on, and I will add; often leaving the donors with an over-the-budget building and a big “success” on their resume. Leave it where it is and fix it. Buildings from the 1960s seem to have been built especially badly. I remember hearing that UW Madison plans to demolish and replace nearly every building from that era because they are junk. Add to that the years that Scott Walker was Milwaukee County Executive and avoided property tax increase by deferring maintenance and you get the current situation. Note that the prior Public Museum building (the City-owned Public Library) is much older but still in good shape.